Home » Blogs » Can We Grow Our Way Out of Debt? Can We Grow Our Way Out of Debt? Suggesting that the U.S. can grow our way out of debt – increasing economic growth to stabilize or shrink debt as a share of GDP – is a popular idea among candidates, but it is not a very plausible solution by itself. Importantly, while faster economic growth does lead to higher revenue collection, it also leads to more spending. Programs like Social Security are directly linked to wage growth and thus grow faster by design when the economy does. Other areas of spending, such as Medicare and interest rates, also tend to increase with economic growth on average. Because faster growth results in both higher revenue and spending, a substantial acceleration in growth would be necessary to put the debt on a downward path. 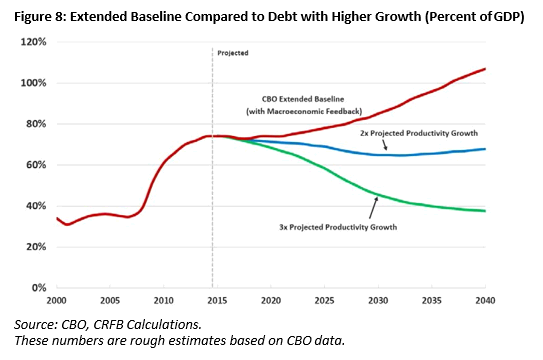 Assuming this growth came from higher productivity, it would need to be nearly twice the levels projected simply to stabilize the debt somewhat below current levels, based on rough CRFB calculations. To put the debt on a downward path to reach its historical average by 2040, productivity would need to be three times as high as projected. In other words, for growth alone to solve the debt, the country would need sustained annual productivity growth between 2.5 and 4 percent. By comparison, the historical record for any 25-year period since 1950 is 1.9 percent. To be sure, higher economic growth has many benefits for the budget and society and thus should be pursued. Tax reform, entitlement reform, and debt reduction can all help accelerate growth. But there are limits as to how much of the debt problem growth alone could legitimately solve.